All my fellow bean lovers, get ready to have a new favorite meal. 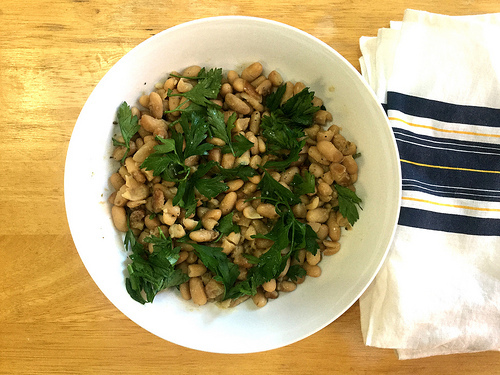 Dead simple and gorgeously garlicky, these beans are destined to be a new staple. We're going way classic here: just beans, garlic, white wine, olive oil, salt, pepper, and marjoram. They all hang out, all day, in the slow cooker, where the beans will get bananas-creamy without completely breaking down. The best part, though, is that the slow-and-low heat effortlessly turns those garlic cloves to deeply savory pulp that you'll stir through the mixture so that it permeates the whole dish. Finish it with fresh parsley for a pleasantly green foil, add a crusty side of bread or a nice square of cornbread, and dinner is served. Bonus: these guys are surely good enough to entertain with (more on that next week). They're ready to be mashed onto baguette slices as part of a mezze platter—or as a quick afternoon snack—or served as a side dish with a larger spread. Any way you serve them, these beans are one seriously satisfying plate. Drain and rinse beans. Set aside in a sieve to let drain thoroughly. Meanwhile, add remaining ingredients, except parsley, to slow cooker. Add drained beans, stir, and cook on low eight hours. Use a wooden spoon to crush the garlic cloves, which will be cooked to a pulp by now, and stir to incorporate fully. Transfer to a serving dish, sprinkle with chopped parsley, and serve.